Emory Law Professor Frank S. Alexander considers it "the litter of a consumptive society" — the vacant, abandoned, tax-delinquent and foreclosed properties that pock many of today's cityscapes. The impact? 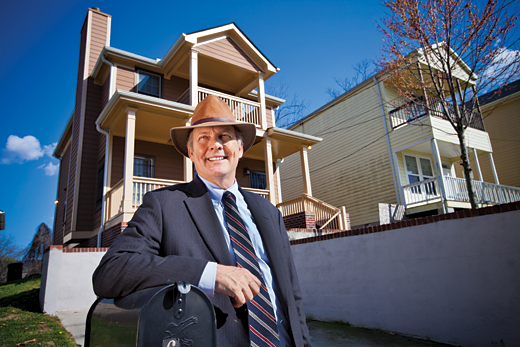 Plummeting property values, dwindling tax revenues and strained public services, coupled with a residential mortgage foreclosure crisis that is still forcing families from their homes, says Alexander, Sam Nunn Professor of Law at Emory's School of Law and a leading authority on housing law. The nation has long struggled over what to do with problem properties, a growing liability in a still-soft real estate market. And states and municipalities often lack the laws, tools and expertise to do much about it, Alexander asserts. But through the efforts of the Center For Community Progress, a national nonprofit organization co-founded by Alexander in 2009 that advocates tackling the spread of urban blight through legal strategies and reforms — including land bank legislation — Alexander and his team are making a difference. This month, Nebraska Gov. Dave Heineman signed the Nebraska Municipal Land Act, marking the fifth state in the last 24 months to enact comprehensive land bank legislation with the assistance of Community Progress. Notably, backers of the Nebraska bill met with success following a legislative template outlined in "Land Banks and Land Banking," a book by Alexander that offers communities and municipalities a step-by-step guide for addressing problem properties in a way that best meets community needs. "Every piece of vacant and abandoned, sub-standard property imposes tremendous costs on the adjoining property and on the city and the county, so vacant and abandoned property is not a 'victimless crime,'" says Alexander. "As we work with local governments, what we are trying to say is this: 'We don't want to take property away from anybody. So either fix it up or pay the fines when the city fixes it up. And if you're not going to do either one of those, then give it up.'" "It's simply saying to property owners: 'You're hurting the rest of us,'" he explains. In the past two years, Alexander and his Community Progress team — which includes Emory Law alumni Leslie Powell and Sara Toering — have also aided the passage of land bank legislation in Georgia, Missouri, New York and Pennsylvania. Simply put, land banks offer an effective tool for public officials to acquire, hold, manage, develop and/or resell problem properties, putting them back into productive use for neighborhood restoration, community investment and development, Alexander says. And in recent years, the demand for help with establishing land banking reforms has only grown. "One of the reasons we created the Center for Community Progress was simply the volume of requests we were receiving from around the country," he explains. For struggling communities, the costs can be considerable: A 2010 study commissioned in Philadelphia found vacant and abandoned properties cost the city more than $20 million in annual maintenance costs and $2 million annually in lost tax revenues — not to mention the impact to community vitality and cohesion, Alexander notes. But the problem isn't limited to larger, urban communities. Increasingly, Community Progress is also seeing smaller municipalities — even consortiums of rural counties — seeking guidance on establishing land banks, property tax foreclosure reforms or housing and building code enforcement. "We're working with a coalition of counties in rural Southwest Georgia, where there's not a town over (population) 10,000, but who have a substantial inventory of vacant and abandoned, tax-delinquent properties," Alexander says. "The Georgia (land bank) statute was written, in part, to give assistance to them, and there are specific provisions in there that deal with rural regional collaboration to achieve these objectives," he adds. To meet the growing interest, Alexander and Toering, Community Progress' general counsel, have co-authored "The Georgia Land Bank Resource Manual." Alexander believes the publication, which is scheduled to be released June 25, has the potential to serve as "a dominant training vehicle for local governments." In July, Alexander and Toering will appear at a conference in Valdosta designed for local governments across Georgia seeking more information on land banks. "We can't keep up with the daily calls we get, so we're trying to maximize the literature and the learning curve for as many people as possible," Alexander explains. Although the U.S. real estate market has shown encouraging signs of recovery, Alexander sees the impact of the recession lingering — along with the need to find tools to effectively address it, he adds. "I think there will be an extensive tail of the foreclosure inventory, because the properties that are of low value are going to be the last ones addressed by the resurgence of the market," Alexander says. "Our 'weak market' communities are going to be plagued by this inventory for years to come." Moving forward, Community Progress is engaged in strategic planning to help determine its future focus. Should the organization next emphasize mortgage foreclosure reform? Housing code enforcement? Vacant property registration ordinances? Disaster relief and recovery? "The question is very ripe, we could go in any of these directions," Alexander says. "I suspect it depends heavily upon local needs — which are the communities that are vulnerable and what are the barriers to those communities stabilizing or becoming stronger?" For Alexander and Toering, this is meaningful, fulfilling work. Both share backgrounds steeped in the law and theology — in 1982, Alexander helped found Emory's Center for the Study of Law and Religion, where Toering now serves a senior fellow. In 2006, Toering received both law and theology degrees from Emory. Through work with Community Progress, they have found a perfect intersection of those interests. "For me, the opportunity to be involved in law as a service profession is the same as ministry: Working with the law in a manner that serves the entire community, working to ensure — to the extent we can — that law is not a barrier to justice, or a cause of injustice, but instead law is that which really permits a community to thrive," Alexander says.